Like all of our road trips thus far in Georgia, we started out on a Sunday morning under a sky that was threatening rain. My sister-in-law was visiting and she was fresh off the plane. The kids were ready to soak in their auntie time and we were all anxious to introduce her to the beauty that we've experienced during our start in this still-new-to-us country that we now call home. My sister-in-law is fantastic. And, that was once again confirmed when she offered to sit in the back of the car with the kids and bounce for hours on end over Georgia's not so smooth roads. She played endless rounds of seven and five year invented games while traveling over jarring terrain. Not an easy task. As the road continued on and became increasingly remote, we experienced the beauty of Georgia's famous blue skies and sun dappled fields. I kept thinking I was living inside an impressionistic painting. The colors were intense and the air was earthy. And, then, just as we were moments away from our destination, I did step right into a painting-- specifically, a Van Gogh painting. I couldn't believe the colors spread out before me as we rounded a corner. Golden fields floating atop a layer of green reached as far as I could see. It all blurred together so beautifully that it took me a few minutes before I realized what I was staring at-- thousands of sunflowers with their heads heavy, looking down at the ground they were planted in. We were all richly rewarded with time spent together and a glorious destination at the end of the road. We arrived at a wind whipped monastery, David Gareja, carved deep into the hills on the border between Georgia and Azerbaijan. 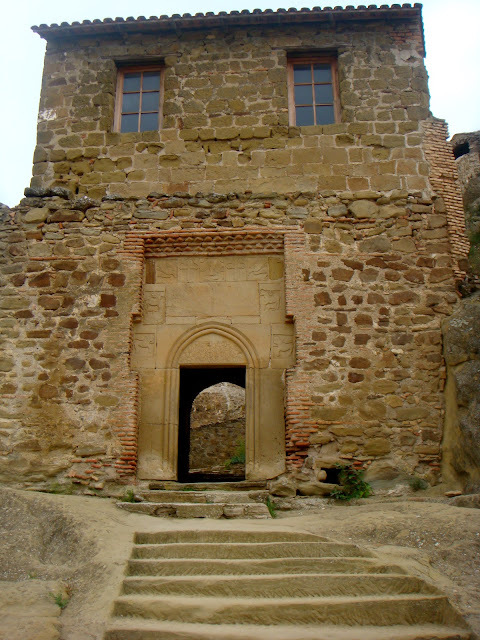 A sixth century, functioning Georgian Orthodox monastery complex located in the Kakheti region of Eastern Georgia, the area includes churches, chapels, caves and living quarters hollowed out of the rock face. The area provides evidence of some of the oldest human habitations in the region and has a rich history involving battles and border disputes. Here's a glimpse at the entrance, followed by the interior which is laden with darkened tunnels, several 'floors' of caves and a small chapel and garden on the ground level. Most impressive to me was the far 'wall' of rock which consists of the monastery's quarters. WOW! The homes carved into the rock are amazing!